Earth is often called the blue marble. But it’s more like a marble cake: a swirling batter of air, sea, and dirt stirred by our spinning planet and baking under the sun. Every day, sunlight streams into the atmosphere, reflecting off clouds and dust particles, warming the air, and making the wind blow. Heat from the sun evaporates water, leaving the sea surface cooler, saltier, and denser and setting currents in motion. Winds also whip whitecaps into currents. Falling rain makes the sea surface fresher and (depending where it lands) warmer or cooler. All of these physical transactions combine to create our climate, and all of them change over every minute and every meter. 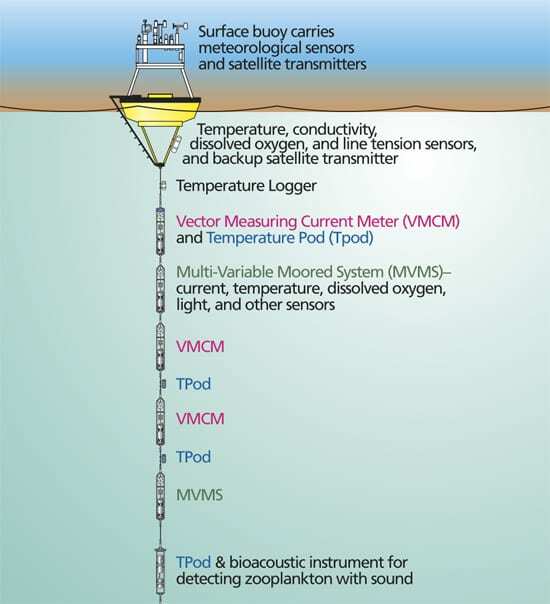 Designing equipment to track climate dynamics—in minute detail and at levels of precision unmatched in the world—has obsessed Bob Weller and the Upper Ocean Processes (UOP) group at Woods Hole Oceanographic Institution. Two decades ago, few researchers thought it was even possible to obtain such measurements in the roiling ocean, Weller said. The doubters, however, were “land-based people, who have the option of cleaning radiometers every day, and [their instruments] don’t rock and roll like buoys do. So they had always been pretty skeptical of ocean data.” Weller set out to change those perceptions. The result of this obsession is an array of seven sensors called ASIMET (for Air-Sea Interaction Meteorology). The sensors measure heat, sunlight, wind speed and direction, precipitation, humidity, barometric pressure, air temperature, sea surface temperature, and salinity. The $60,000 systems are currently bolted on a half-dozen ocean buoys and fastened to the masts on the bows of a handful of research and volunteer commercial ships around the globe. Left alone for up to a year, the instruments send back enough data for Weller’s team to calculate, minute by minute, exactly how much heat, fresh water, and momentum moves between atmosphere and ocean. 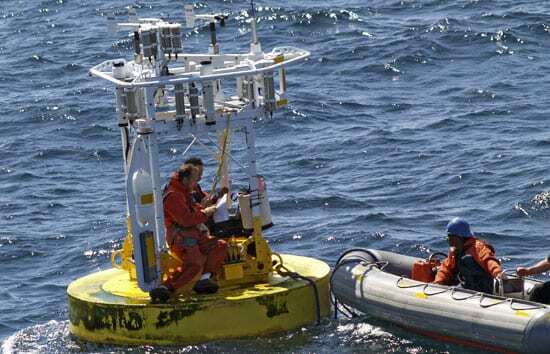 ASIMET began life in 1988 when scientists realized that large inaccuracies in sea-surface measurements were holding back advances in understanding ocean-atmosphere interactions. The ASIMET program, then called just Improved Meteorology (IMET), sought to create an integrated system of sensors that would simultaneously take measurements of all the various factors that computer-driven models needed to calculate climate. By 1993, Weller’s group was testing prototypes at sea. By 1995, the first generation of IMET was up and running. Seven sensors housed in plastic tubes shaped like tennis-ball canisters made the necessary measurements. The system drew about 7.5 watts of power and ran partially on solar panels. Ever since, ASIMET designers have made continuous improvements to the system despite investigating plenty of dead-ends along the way. They fabricated a grating to create more space for instruments atop buoys, but they abandoned it after finding it disrupted airflow. Solar panels sounded like a good idea but were foiled by clouds and beaten by rough waves. Hourly broadcasts to satellites blasted instruments with static, drowning out measurements. Eleven years later, ASIMET sensors are shielded inside titanium canisters and use 92 percent less power, freeing the system from dependence on solar panels. They measure more precisely than ever, too, yielding estimates of heat flux that are 90 percent more accurate than in the days before IMET. Leaving ASIMET systems alone on buoys in the open ocean introduced the team to brutal design challenges. One of the most painful lessons came in the early 1990s off Iceland. A buoy snapped loose after it began to pitch at the same frequency as storm waves, loading the buoy’s mooring line with 7,000 pounds of pressure every 15 seconds. Now, a design program ensures buoy moorings are “detuned” before they go out. 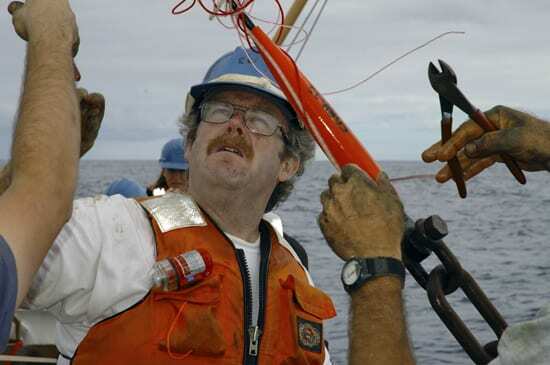 In his office, Weller still keeps the broken pear link that had connected that buoy to its mooring line. 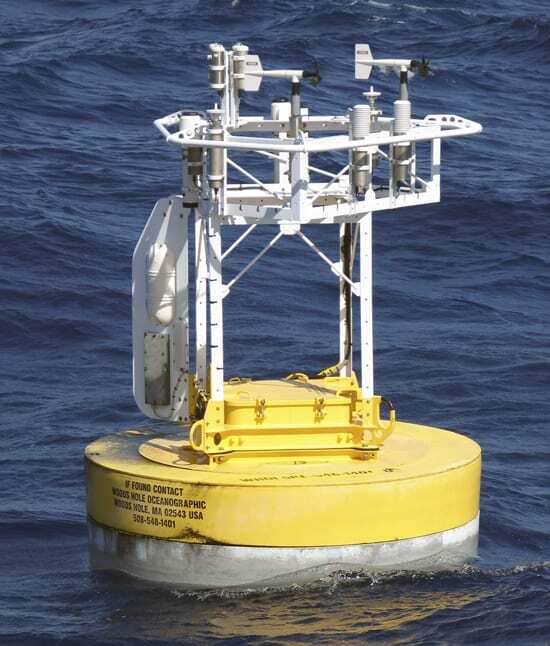 A fully equipped ASIMET buoy is a far cry from a lobster trap or channel marker. The base is a 10-foot-wide puck of yellow Surlyn foam. From it rises a 10-foot scaffold that bristles with instruments. A thickened wind vane runs down one aluminum support, brandishing two satellite antennas and pointing the buoy into the wind. On the tower top, 12 or more instruments cluster at the upwind edge where the airflow is least disturbed. Below, a watertight trapdoor leads to a hold stuffed with knee-high stacks of batteries. Sharing space are two microprocessors that control the instruments, archive the data, and send out hourly updates via satellite. At weekly meetings, the UOP group hashes out equipment problems. With Weller consulting a whiteboard list of cruise deadlines, about a dozen men and women supply mooring, hardware, software, and logistical details. Brainstorming is fed by fresh donuts or, recently, an authentic German layer cake courtesy of Frank Bahr, a WHOI research specialist who oversees ASIMET deployments on volunteer commercial ships. Even after 18 years of sweating the details, calibration is an incessant worry. It doesn’t matter how accurate a freshly polished sensor is on the WHOI dock. It has to measure unflaggingly for a year at a time while it gets battered by waves, chilled in gales, or encrusted with salt spray and seabird poop. The team has three main approaches to the problem of consistent measurements: lab calibration (or “burn-in”), redundancy, and calibration at sea. Burn-in involves incessantly monitoring and retuning an instrument for six weeks on land before a cruise. All ASIMET deployments include at least two full sets of instruments, each set keeping an eye on the other. Technicians carry a third complete set on all cruises in case a sensor malfunctions on the way out. Before and after each buoy deployment, the researchers dedicate an entire day at sea to checking the buoy’s instruments against the ship’s onboard readings. Now that the system is precise, reliable, and frugal with power, Weller dreams of deploying it on more buoys at more places around the globe. 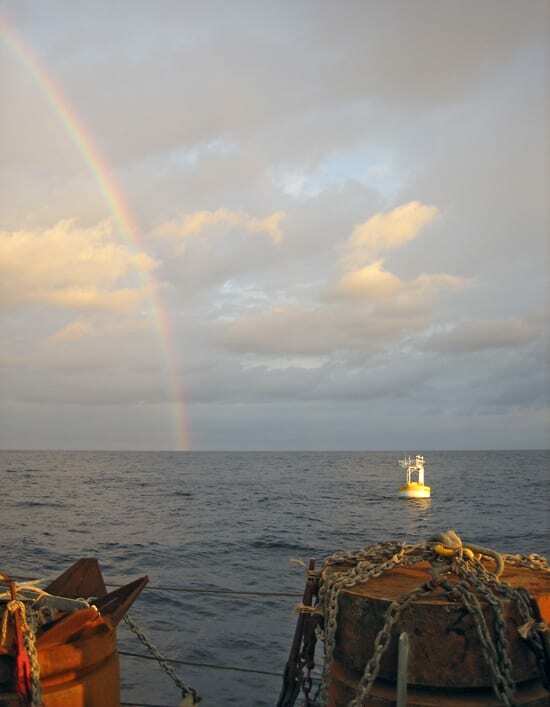 Although blanketing the ocean with thousands of ASIMET buoys isn’t practical, Weller notes that buoys in perhaps 10 carefully chosen regions per ocean could lead to huge improvements in understanding how the ocean affects global climate. Weller’s list includes some regions he already has covered, such as in the heart of the Gulf Stream and in a perpetually overcast region off Chile. Sites on his wish list include the region downwind of the Sahara, where windborne dust might be either blocking sunlight or heating the atmosphere; and the brutally rough Southern Ocean where present buoy designs simply can’t survive the winter. For the future, Weller’s group is still looking for the perfect radiometer, perhaps the system’s most finicky sensor and one crucial to measuring both heat and light. Wind gauges are still unreliable in very light and very heavy winds. David Hosom, one of the original IMET engineers, now emeritus at WHOI, covets a $4,500 rain gauge that measures individual drops of rain. And the team is adding another crucial climate measurement: carbon dioxide. 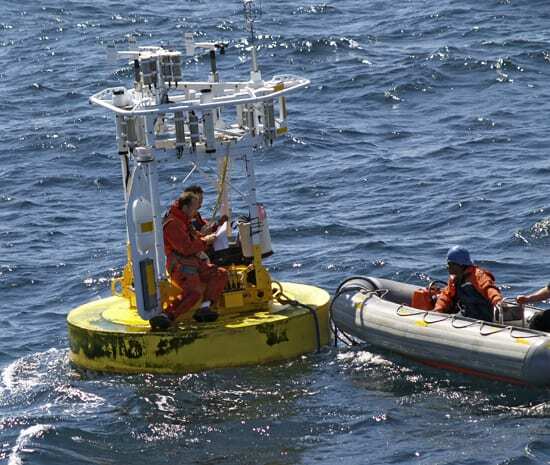 In October 2006, Weller and his group departed Chile to install a buoy equipped with a CO2 sensor made by Chris Sabine at the NOAA Pacific Marine Environmental Laboratory in Seattle.